Ray Bradbury died this week at the age of 91. The tributes came from far and wide. His books and stories have seeped into so many corners of the globe. I discovered him in 6th grade, shortly after moving up here. I can dimly recall going into the school library one day and passing the shelves, reading the titles on the spines. I can't recall why exactly, but it was probably because of the way the book appeared. It was a hardcover with softcover dimensions, with an appealing font and a look of durability. 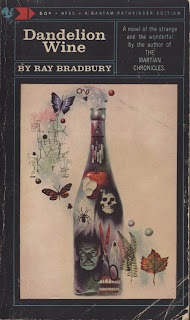 It was one of Bradbury's early novels, Dandelion Wine. It's about a boy's coming of age in small-town Illinois. 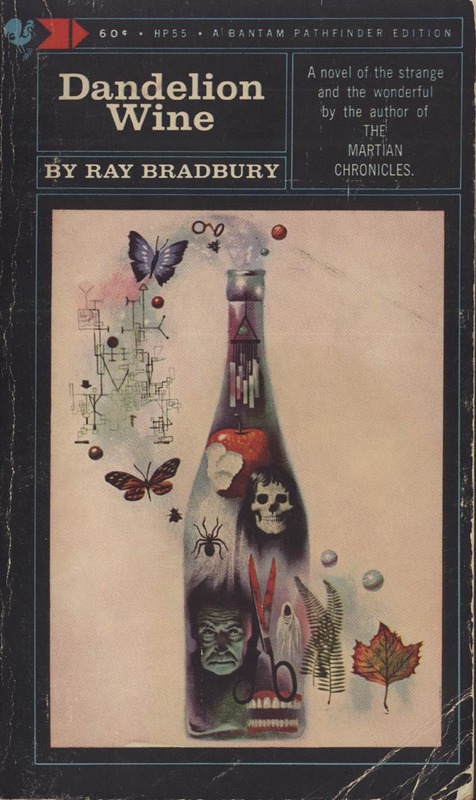 Bradbury's evocative descriptions of summer nights, the smell and feel of new sneakers, and the charged moments of youth were new landscapes for me in fiction. I'd never read a story where it so closely matched my own experience, even if I didn't live in 1928. I'd just moved to a small town at the time, so timing had a great deal to do with my fascination as well. The life I'd imagined I was moving to no longer existed. It had vanished years before. This book offered me a glimpse into what I had missed, and wished could be recovered. If not the reality, then at least my romantic version of it. Bradbury's prose was steeped in poetry. He wasn't a dense writer. He used words carefully, making sure every one had meaning. I was soon devouring his other books. I found his short stories, specifically the collections The Illustrated Man and The Martian Chronicles. You could only envy the ideas he came up with. There was the story Kaleidoscope, where a small group of astronauts are stranded in the midst of space, with nothing but their spacesuits and a couple hours of oxygen supply. Knowing they face death, they talk to each other about existential matters, trying not to think of the inevitable. Another story, titled All Summer in a Day, concerns a class of young students on Venus, where it rains constantly...except for two hours during one day out of the year. We read about the student's myriad reactions as the sun appears for that short window of time. To me, these stories were like effective pop songs. They had an irresistible hook. You wanted to see the characters' reactions, and you compared yours with theirs. Many of these stories dealt with humans up against the meaning of their existence, faced with their impermanence against the vast black canvas of the universe. Their own, or just the elusiveness of the present moment. How easily it slips from our grasp. What else do we have, really? I wrote Ray when I was 12 or 13, asking for writing advice. His work must've moved me tremendously then. He sent back a short letter, much to my surprise, telling me to write every day as he did, starting when he was 12. He also recommended a couple of books, one of which I did read. It was The Summing Up by W. Somerset Maugham, who turned out to be one of my favorite authors growing up. I never matched Ray's work ethic. He did open up in me a love for good writing though that remains with me to this day. I thank him for that. May you find peace, Ray. And I hope that what you gave to me is returned to you tenfold.